I agree with Marina Cantacuzino that forgiveness is not the exclusive property of Christianity. He quoted several faiths scriptures on forgiveness and reconciliation. I think that gestures are very important in higher levels of forgiveness, reconciliation and peace building. He highlighted the visit of Queen Elizabeth II to Ireland in 2011 that won her great respect from the Irish people. Her visits to places precious in Irish history for those who did battle with the forces of the Crown won the hearts of many in Ireland. Her words in Gaelic and other sincere efforts changed Irish opinions such that many will be celebrating her Diamond Jubilee this year. The 1977 visit of Anwar Sadat to the Israeli Knesset was a gesture that opened the way to peace between two nations that had been frequently at war. Where are the religious leaders were when there are efforts for peace? Universal Peace Federation’s founder Rev. Dr Sun Myung Moon has promoted the establishment of an Interreligious Council at the UN. Religious leaders, who business is peace, centred on the wisdom of their faith built up over many generations, can take an innovative approach there, from the politicians whose agenda and focus is different. The biblical account of Jacob and Esau’s reconciliation after 21 years of separation and Esau’s growing resentment illustrates a successful religious approach. Jacob offered all that he had earned over those years to his brother. He bowed humbly before Esau seven times. Esau embraced him in tears. Rev. Moon has been trying to reach out to North Korea to achieve reconciliation despite it being the last bastion of the cold war. He visited President Kim Il Sung in 1991 to forgive and reconcile after experiencing severe personal as well as national difficulties because of the North Korean leader and Government. He has provided a car assembly factory and other initiatives to help North Korea to develop. The Universal Peace Federation seeks reconciliation on many levels. However as we are now sitting in Parliament we do want to urge our political leaders to establish or maintain the moral foundation that is necessary for peace and reconciliation. 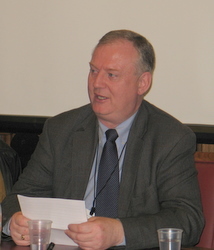 Jack Corley is the UK Chairman of the Universal Peace Federation.